EarDial HiFi Earplugs are perfect for music lovers, party goers, motorcyclists, musicians (playing guitar, bass, drums, singers, DJs, etc. ), bartenders, bouncers and anyone that wants to hear clearly and safely in a loud event, like concerts, music festivals, studios, nightclubs, sport events, gyms or cinemas. Also for DIY or work where you need to block noise but hear the environment. And of course it will help people with tinnitus or other hearing sensitivity. If you ever came home with ringing in your ears after attending a loud event, that’s called tinnitus, and although that probably went away, you damaged a certain percentage of your hearing cells permanently. Tinnitus can be permanent (and extremely annoying), and together with NIHL (Noise Induced Hearing Loss), they are diseases worryingly growing among young people. The WHO (World Health Organization) did a study in middle and high-income countries, and they found that nearly 40% of all teenagers and young adults put themselves at risk for NIHL with damaging volumes at entertainment venues. That’s a lot of young people who might permanently damage their ears. Once lost, hearing cannot be restored. Experts agree that long exposure to levels of sound over 85 dB can cause hearing loss. Most clubs and concerts are over 100 dB. The maximum safe-time without protection at that level is around 15 minutes! If you enjoy attending clubs, concerts, or other loud events, you need to protect your hearing. Foam ear plugs would protect your hearing, but they would also block some of the sound frequencies that you want to enjoy when listening music. Traditional musician ear plugs usually have some color and stick out of your ear which makes you look funny and are uncomfortable under a helmet. EarDial has a noise filter that will block the harmful decibels without sacrificing sound quality. You will be able to enjoy the music and chat with your friends while protecting your hearing. In fact, our earplugs will enhance the music experience to most people, because they remove the ear-pain factor from the loud music. You will also hear clearly other cars in the road, movie dialogs, your gym instructor or your work colleague. Our design is as discreet as possible. We made it low-profile, so it doesn’t stick out of your ear, but it is still easy to put and remove. We use a high-transparency color for both the shell and the filter, so when you put them in your ear, they take the tone of your skin and are almost invisible. We made them out of hypoallergenic silicone, latex-free, so it will be nice to your skin no matter how sensitive it is. Also the silicone is very soft, so you can wear them comfortably for long hours. The elasticity of the silicone make your earplugs very resistant and you will be able to reuse them for many years, most likely forever! 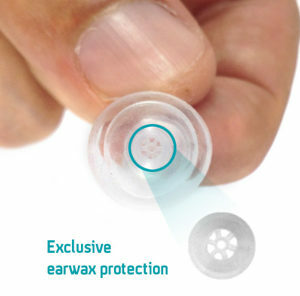 Our exclusive earwax protection will protect the precision filter so you will have your ear plugs clean and with a clear sound for longer. You will also get a compact aluminium case with your earplugs. This case is small and with a strong lobster clasp, perfect to put in your keychain or pocket and carry with you comfortably at all times. You will have your earplugs ready to be used even in unexpected situations. The aluminium case has an easy to open and close cap, so you can use it, even if you had a few drinks, without the risk of stripping the thread. We also included a luminescent sticker that you can optionally stick in your case, so it can be found in the dark. For example if you carry it in a purse or backpack. All materials we use, also for the packaging, are non-toxic, recyclable, and won’t release any chemicals. We developed a companion mobile app that will tell you the approximate sound level pressure you are currently exposed to, and it will tell you how long you can stay at that level without risk of hearing loss. You can compare the results if you are wearing EarDial earplugs or not. When you activate the EarDial switch, it will adjust the calculations based on the EarDial attenuation levels. You have inside more information about the decibel scale, the noise dose formula, attenuation standards, and more. You will be able to calibrate the app to your specific device. More information how to do that inside. It is available for iOS and Android. You just need to search “eardial” in your app store. Totally free of charge. Useful even if you are not an owner of EarDial earplugs! We are on a mission to bring awareness and let people enjoy loud social events, while protecting their hearing against tinnitus and NIHL (Noise Induced Hearing Loss). We donate 5% of our profits to charities with the same mission, like Dangerous Decibels or Action on Hearing Loss. When you support EarDial, you are also supporting a good cause. EarDial is one of the best gifts you can give to yourself or to any of your loudness exposed friends!